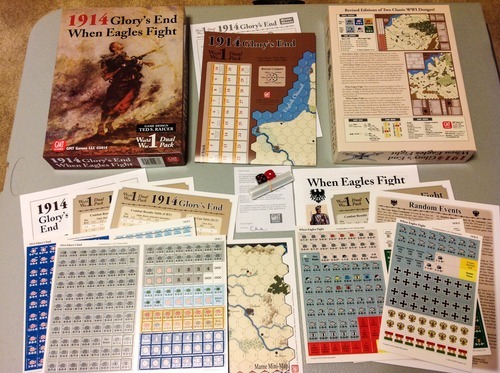 1914: Glory's End, a Charles S. Roberts Award nominee, covers the first three months of the war on the Western Front, as Imperial Germany gambled its future on a decisive victory over the armies of France, Belgium, and Great Britain. The resulting stalemate doomed all of Europe to over 4 years of blood and destruction. 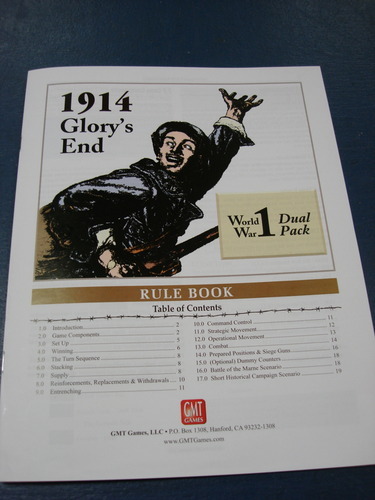 1914: Glory's End manages to cover all the important characteristics of the campaign, with rules for Prepared and March Combat, trenches, forts, cavalry, command and control breakdowns, supply, strategic rail movement, Allied sea movement, German forced marching, Plan XVII, and more - all while remaining easy to play. 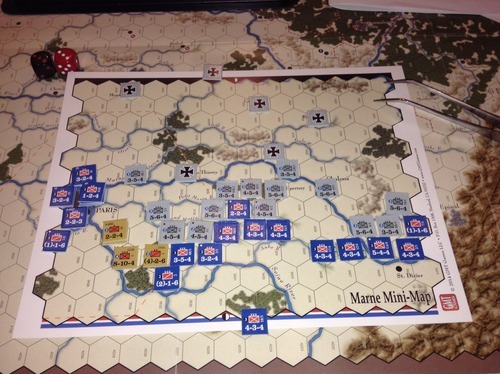 The campaign game runs a full 30 turns, but the game includes both a mini-scenario on the Battle of the Marne and a short ten turn campaign scenario covering the decisive opening weeks of the war. 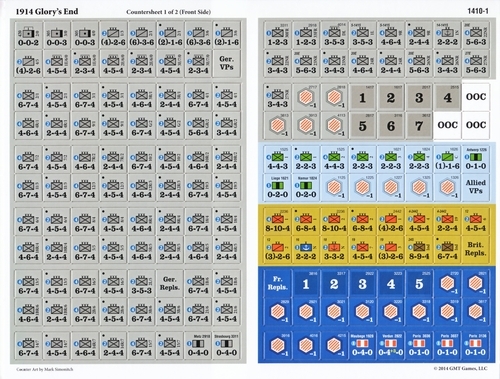 In addition, the campaign games can be played in historical or free set-up versions. 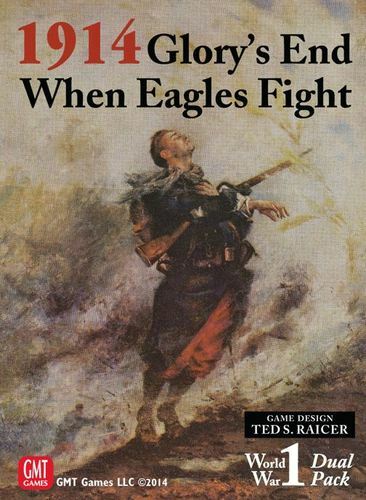 When Eagles Fight: This revised and improved edition of the Charles S. Roberts Award winner for best pre-WWII game recreates the titanic struggle of the Eastern Front on the Great War from the initial clashes at Tannenberg to the revolution that brought down Tsar Nicholas II. When Eagles Fight has a set of low complexity rules which don't sacrifice the historical feel of these massive campaigns. Rules cover German Heavy Artillery, the OberOst and Stavka Headquarters, Russian ammunition shortages, fortifications, the Brusilov Offensive, the slow pace of Russian mobilization, and Austrian Lock-Step Planning in the opening days of the war. A Random Events table covers the effects of the war's other fronts, and a short "What if?" 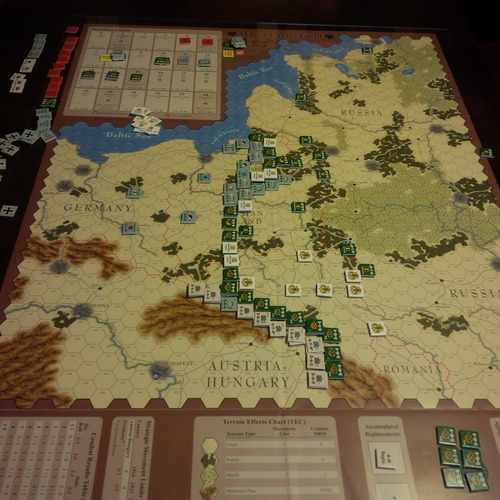 scenario is included assuming an initial German concentration in the east in August 1914.